Thursday. 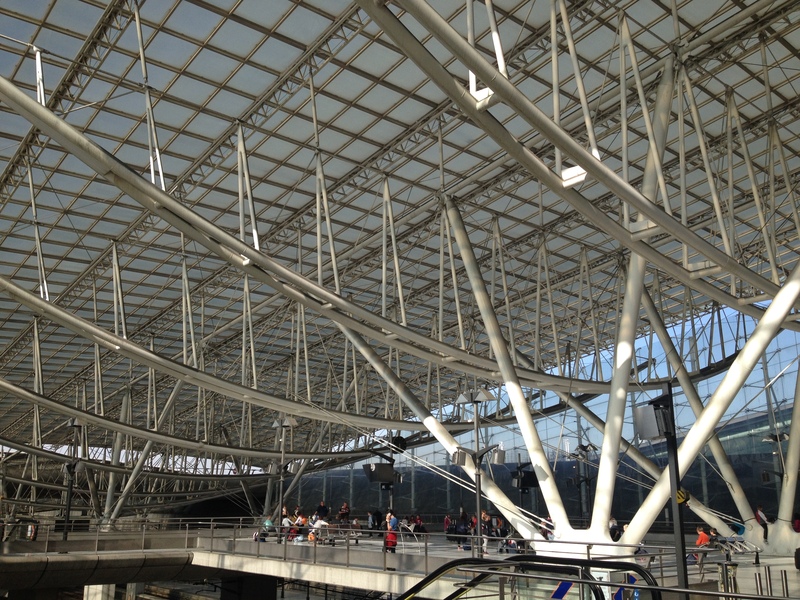 Arrival, into airport Charles de Gaulle. I’ve never warmed to the older Terminal 1. It’s a silly donut of a building, Wastes your time. Terminal two is even more enormous, and thus equally alienating, with the important caveat that’s far, far more beautiful. Later that evening, meet an old friend for supper. 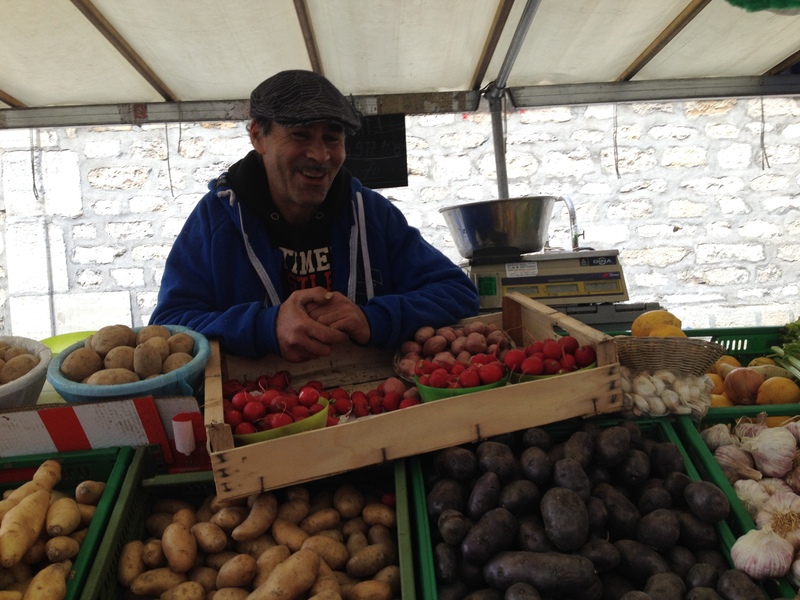 A long-time Paris resident now, he freely admits he mostly settled there mostly for the food. With his local expertise, we have dinner in a magic little restaurant on rue Paul Bert. Where i eat the best asparagus, followed by the best Ossobucco, I’ve ever tasted. 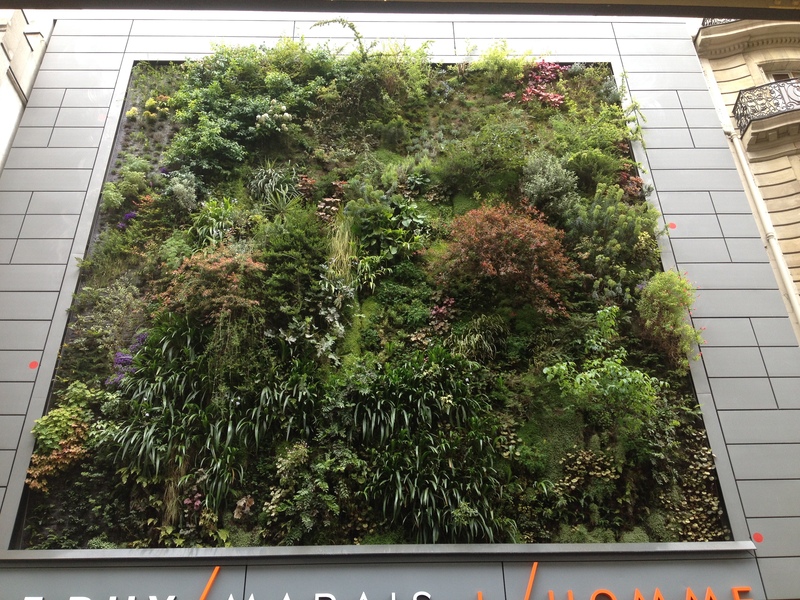 very taken with this rather cool vertical garden. Yep, it’s a garden. It’s pretty big, about the size of a tennis court. And it’s vertical. Passing back this way later that evening, or was it another evening, I bought a nice sweater here. Inside the shop I mean. This is now my definitive favourite sweater. I treat it, the sweater, with great reverence. I am secretly convinced i look like a film star when wearing it. 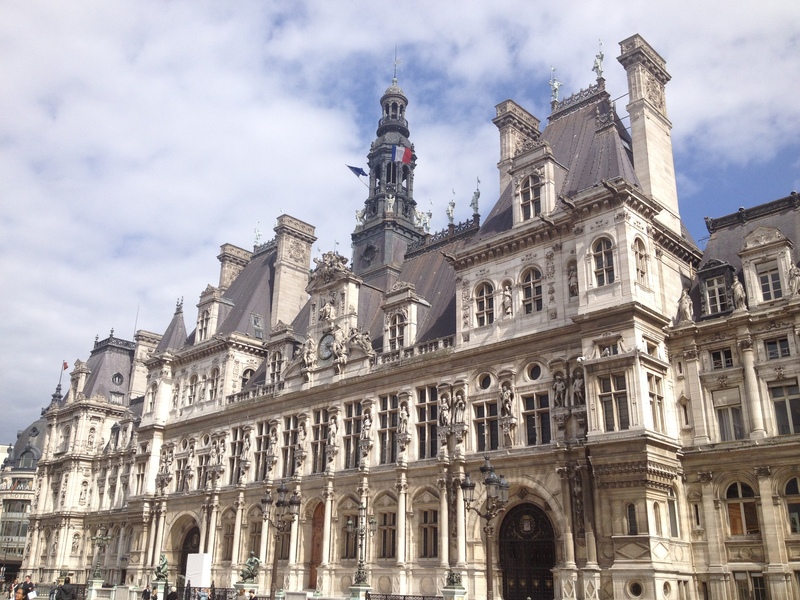 The tour continues, past the Hotel de Ville. where we pass this obscure church, below. I’ve no idea what it’s called. 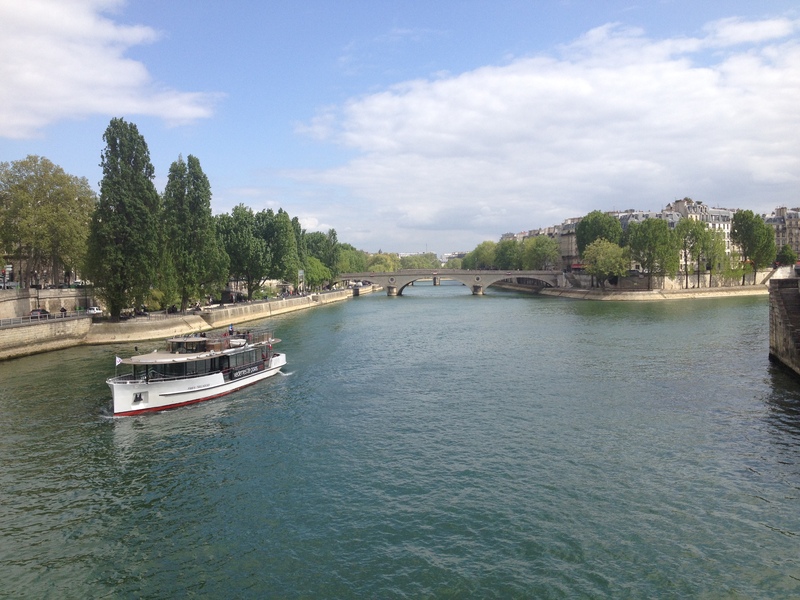 On the far side of the river, we make a stop at the famous Shakespeare and Company bookshop on the quays of the Seine. 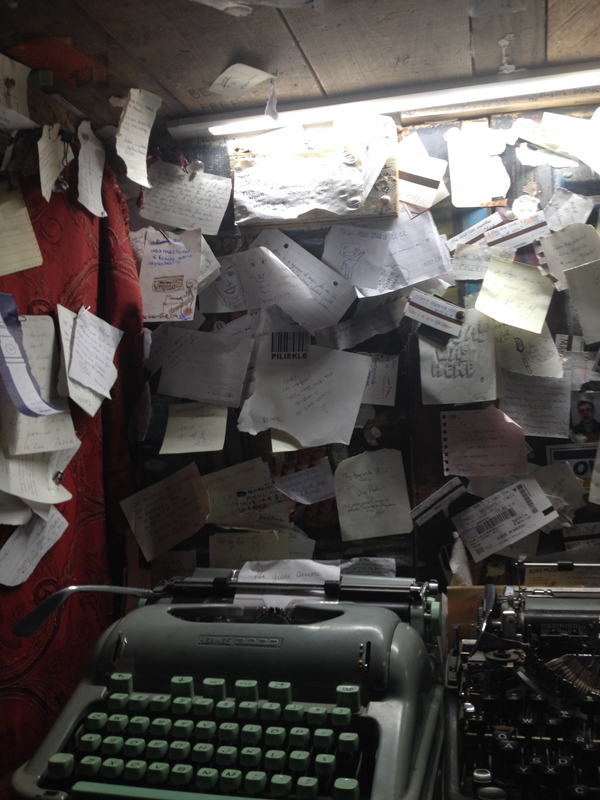 Above: the tiny typewriter room, more of a covered alcove really, inside Shakespeare and Company. Typewriter used, one presumes, by the many, mostly American young aspiring writers who stay here, following their literary dreams and in the footsteps of their heros to Paris. Hemingway, and Stein, Joyce, Beckett et al. It would be easy to rhapsodize about the history, traditions, and old bookish smells of Shakespeare & Company. Equally easy to don a cynic’s hat, and to pour scorn on cliche and the literary-heritage industry. So I shall desist. On both counts. In truth, I’ll always have a soft spot for S& Co. A long time ago, I found a job off the notice board here. Long story. God that’s a while ago now…. Years later, went back to have very good poetry reading here once, think it was in ’05, glasses of red wine by the river and some really good poetry. Back still when old George Whitman was still alive. he kindly gave us all wine. I’ll always remember one particular poem. It was called: “The case for not speaking French in Paris”. Sigh… Sorry. What is it about Paris and nostalgia? Anyway, sorry. On with the tour. Over to Sainte Suplice. 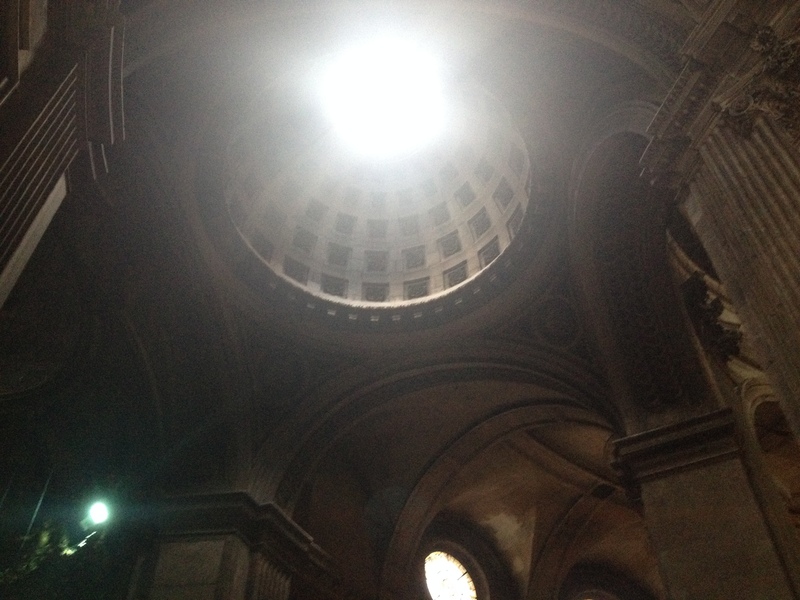 Looking upwards, inside the glorious gloom of that huge church. 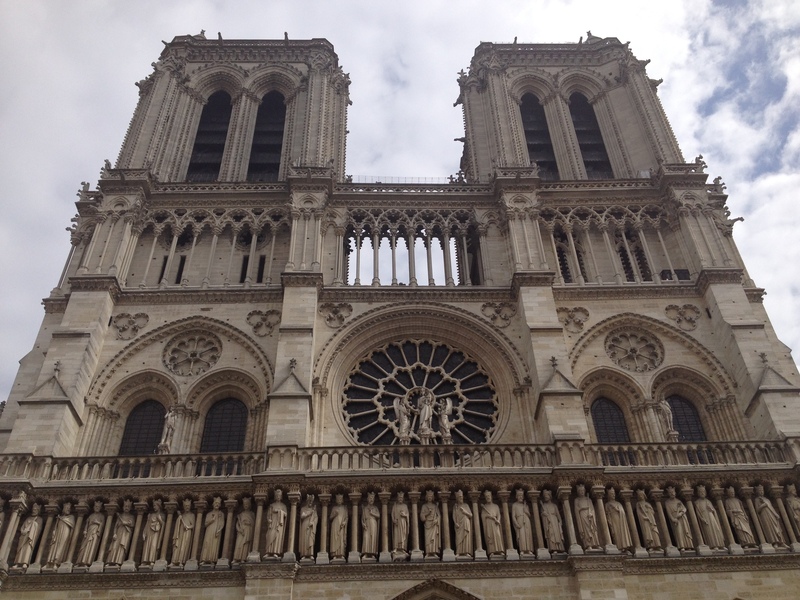 This is the second largest church in Paris, the great soaring vaults only fractionally smaller to Notre Dame. Sainte Seplice was deliberately, symbolically, just made an inch or two shorter, in deference to Notre Dames’ status as the city’s cathedral. Go see the Delacroix pictures, Jacob wrestling the Angle, in the side chapel. And the genome of course. 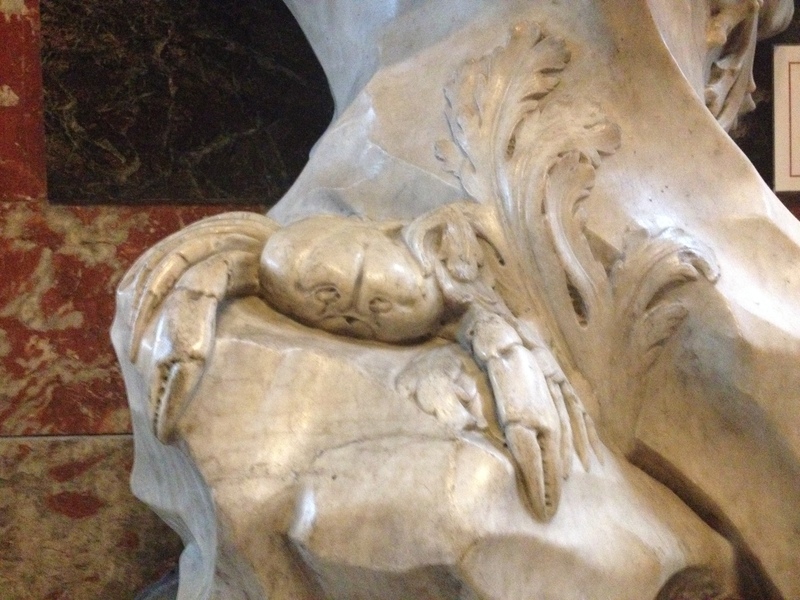 Why does the crab look so sad i wonder? You’d have to feel for him. The rest of the afternoon, is spent sitting on rather excellent sun loungers, soaking up in the early evening sun in the Jardin de Luxembourg. After a long dreary Irish winter, it’s spring at last, here at least. The sun is a balm to the soul. The evening is spent on the long walk home, with pit stops for glasses of wine, and pernod, The later remainder of the evening is spent slumped, exhausted but happy, at a very cool little bar back in the 11th. More wine, more Galois and pastis. Et bon nuit. That was Friday. explore local area, all around the 11th. Directed by Simon, my old friend at dinner the evening before, explore this super food market, both the much larger area of stalls outside and this charming old 19th Century covered section. With my mis-spent 20’s lived just off las Rablas where I was lucky enough to have the legendary Bocarilla as my local food hall, I’m something of an old covered-market aficionado, or snob. 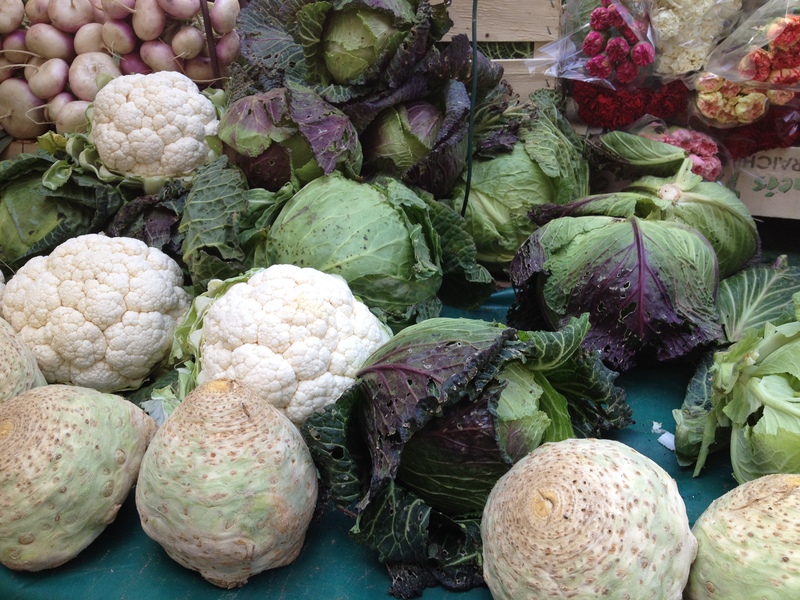 From Barcelona to Buenos Aires, I do like a good market. This one is nice. The pleasures continue on the stalls outside, a riot of colour saturation, and the massed pleasures of fruit, fish and veg. 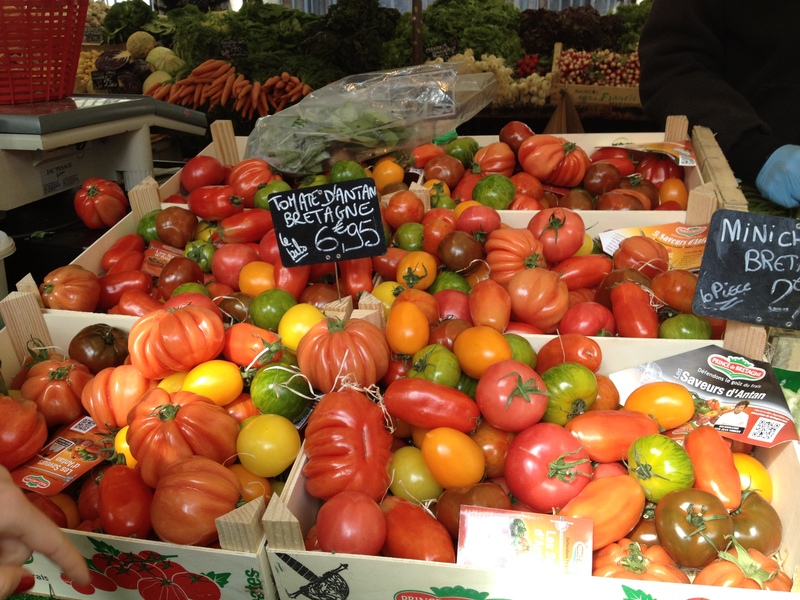 Everywhere one looks one is reminded of one of the main reasons for the superiority of French (or Italian or Spanish cuisine) over more, well, free market anglophone “cultures” – primarily the endless, fresh, local, seasonal, ingredients. You don’t find tomatoes like this in Tesco’s. Oh no. This is a culture and heritage worth fiercely protecting. Vive la France. 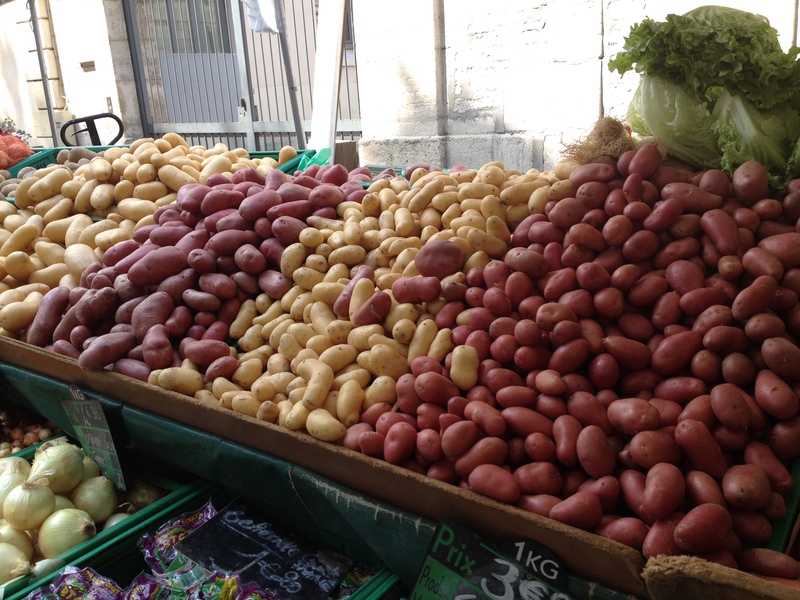 I asked the stall holder how many types of potatoes did he sell? He mentioned a figure north of 100. I asked, (i can’t remember if it was in my unspeakably bad French, or in my best TEFL-teacher-internationally-undertsandable English) if there were even really 100 varieties? He gave me a pitying look and told me Mais oui, bien sur, sure there are over 5 or (was it 6?) 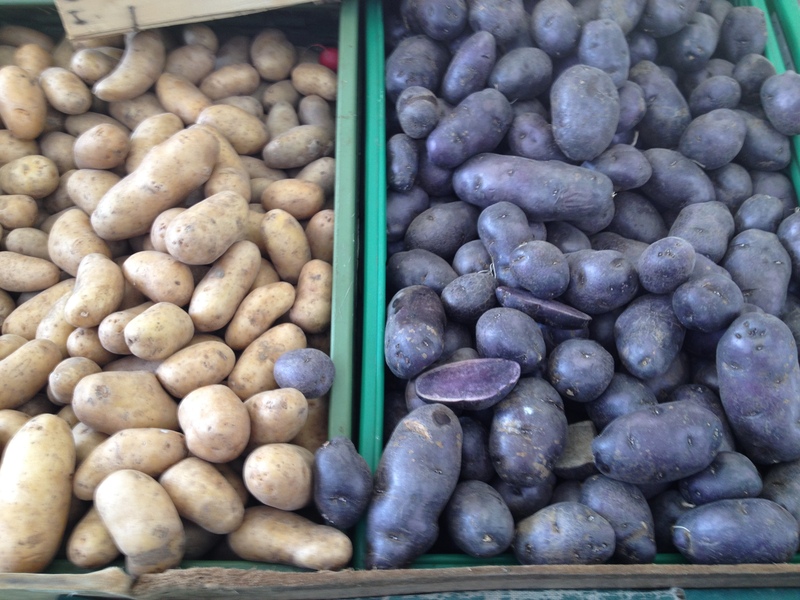 hundred varieties of spud. That was me told. He was brilliant this man, basically. Totally happy. beaming, with pride, and detailed knowledge. (Nothing, nothing, is simple, there is a lot to know about everything when you get up close) He was absolutely passionate and happy about potatoes, beaming with passion and pride. I loved him, basically. There, I’ve said it. 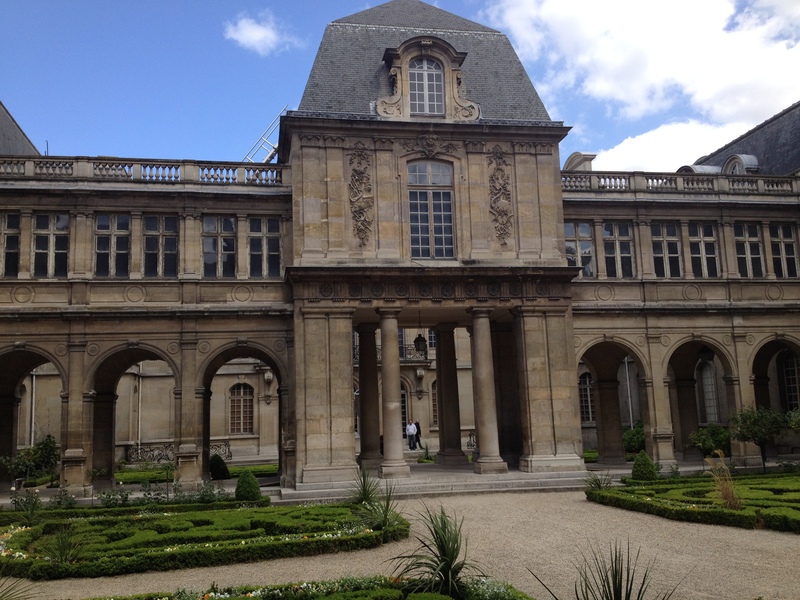 The next find, and it really was an accidental find, stumbled upon it, was my personal highlight of Paris. I can’t believe, am almost fuming, that i didn’t know about this place before. Can’t believe I’m admitting that fact now either. and you’ll find this lovely sun-soaked little square. But this is only the beginning. One spots another little flight of steps. To find another square. Then you go up again. And suddenly you find you are on a sort of elavated walkway park. Hang on, its not “some sort of elevated park” It is a elevated park”, an elevated, linear park. 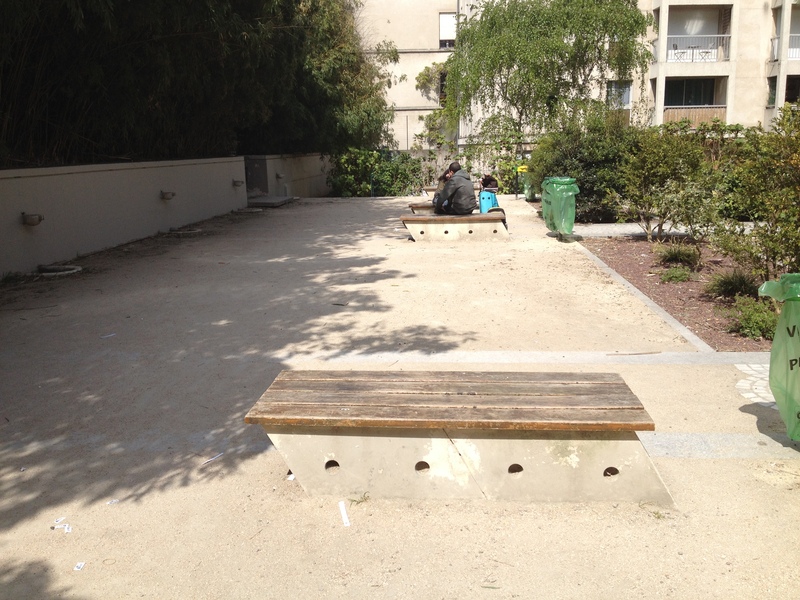 WE had stumbled upon the a 4.7 km-long elevated park known as le Promenade Plantée – built on an old disused railway line. This railway line became disused in the late 1960s, but was then restored, transformed and planted through the 1980s. The whole wonderful thing opened in 1993. 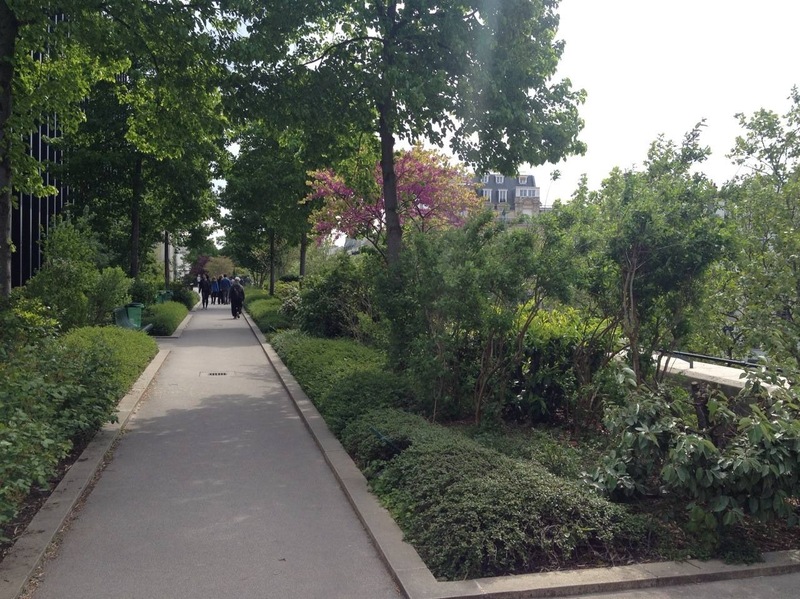 This, le Promenade Plante, is first such park in the world, Ive since learned. New York has one too the High Line, which i had heard of but never visited. Chicago has one too these days, the Blomingdale Trail, which I’d say is wonderful. 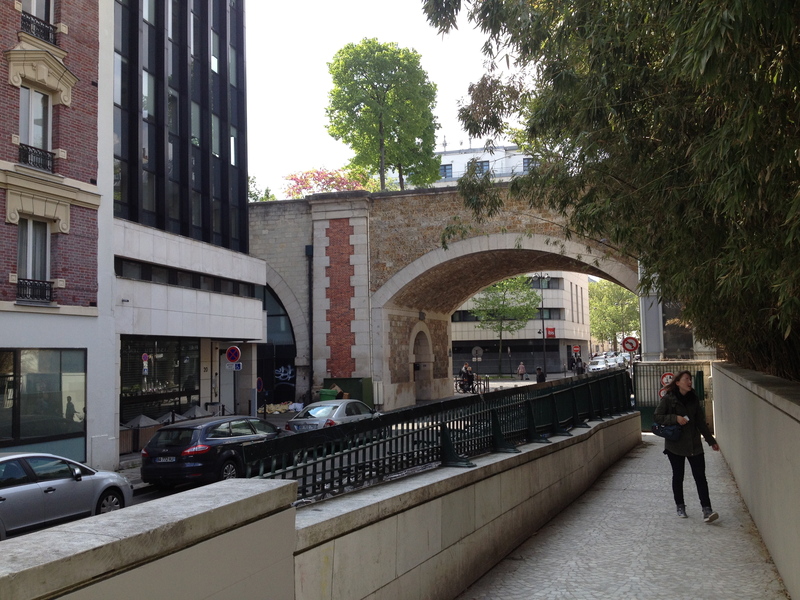 But Paris was the pioneer of linear, elevated urban parks ,built on old railway lines. They are a very good thing. As always with these things, the concept is brilliant but the quality and attention to detail is equally important. Here, the choice of planting, the paving, boarders, and detailing. are all brilliant. I loved this whole thing. Walking with another friend that day, we followed it for miles. 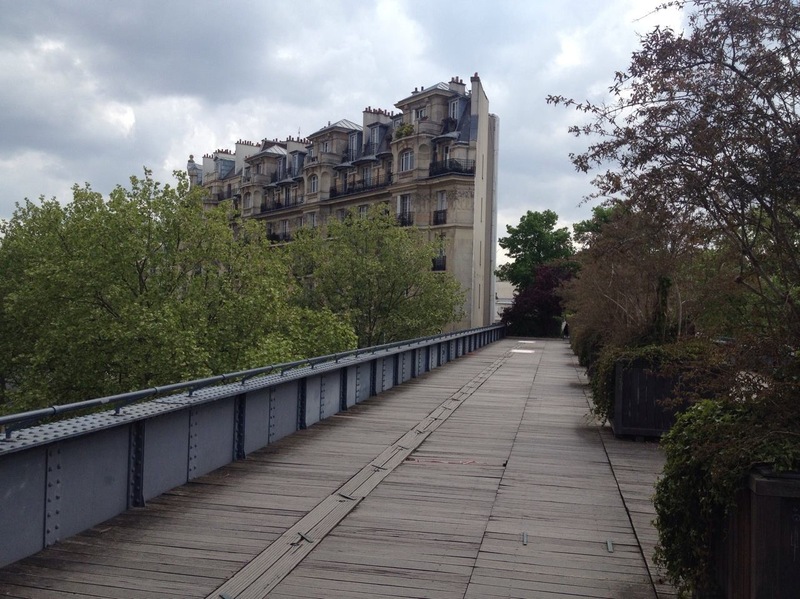 I love the different perspectives, the way you are above the streets and the unexpected way you bisect streets, seeing boulevards high above the road, crossing terraces at 3rd floor level. All quite odd and brilliant. 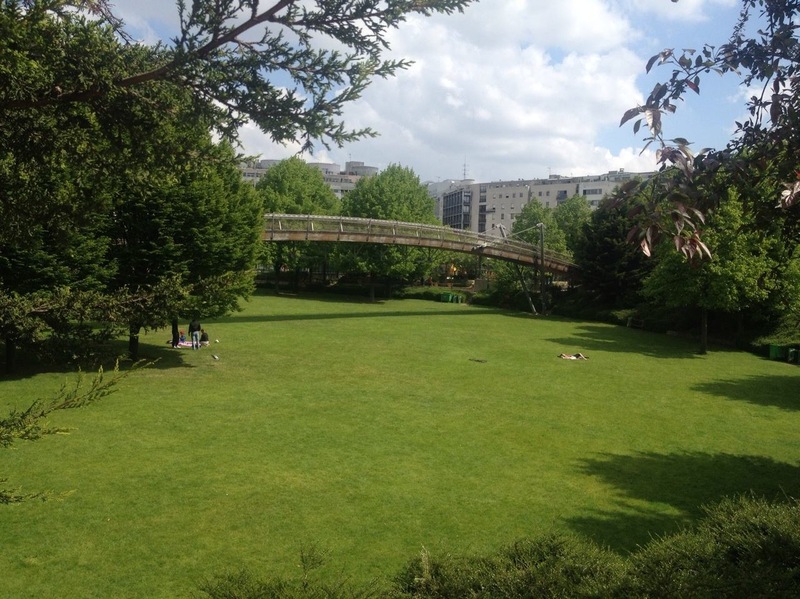 At one stage there is a bridge that crosses over a park. There you can descend. And sunbathe, or eat ice cream, or drink coffee. Or all three. This place also makes me deeply happy. Days 4 and 5 will be coming soon, to a blog post near you. 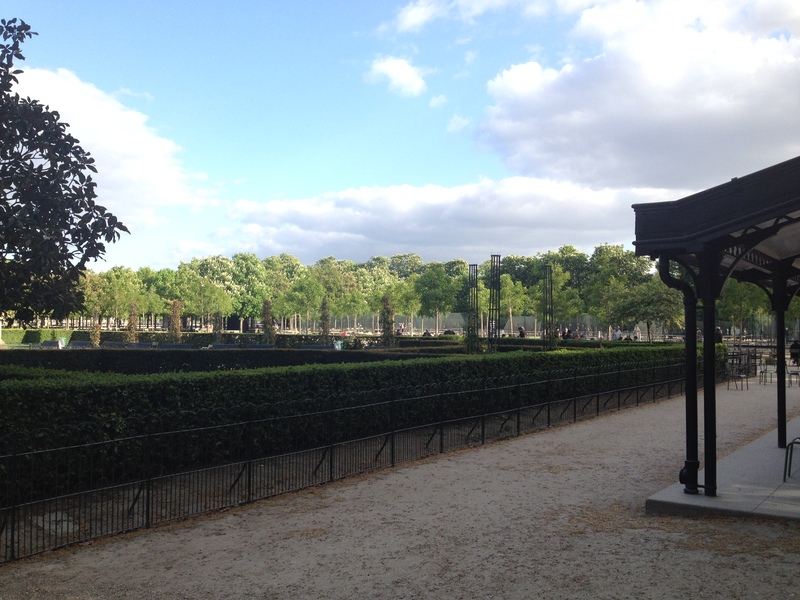 To read more from the Wikipedia entry, about the wonderful Promenade Plantée of Paris, see here. Thanks for reading. Hope you’ll joi me next time. Thanks for the tour Arran, it’s been too long since I was in Paris. 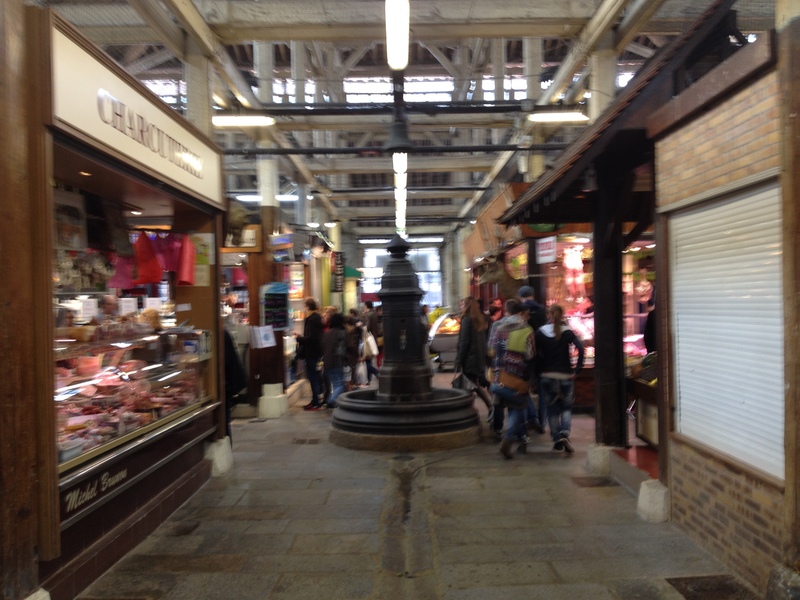 Though for indoor markets my vote still goes to Cork’s English Market. Thanks Roy, delighted you enjoyed. You’re dead right about the English market in Cork too, it’s a brilliant place, wonderful atmosphere and superb produce too of course, County Cork being the gastronomy leaders of Ireland by a long way, the countryside stuffed full of those little artisan producers! Previous Post Have card, must be business. Dublin Decoded tours. 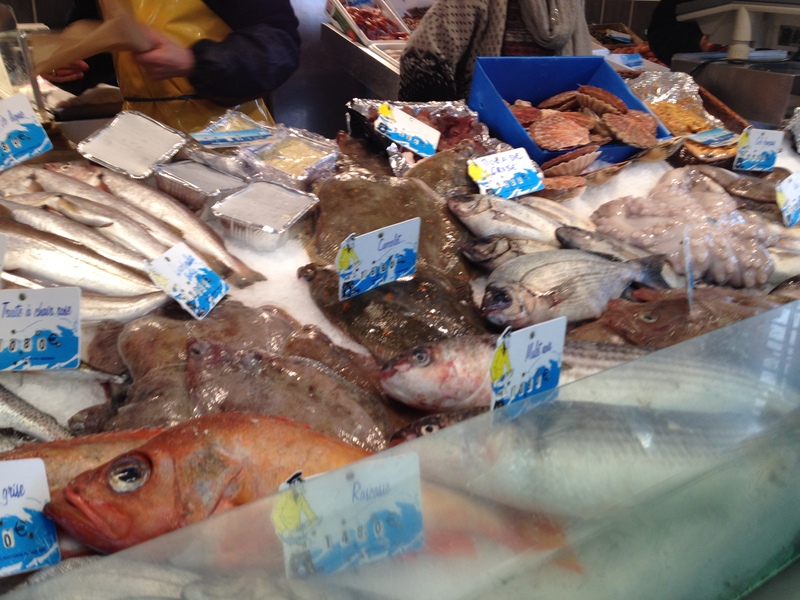 Next Post Paris Pictures part ii: snakes & elephants, a morning at the Flea market.